our wide range of USB products. USB makes connectivity incredibly easy. 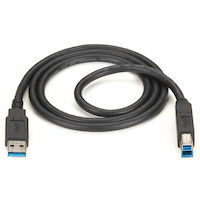 USB (Universal Serial Bus) makes connecting peripherals—printers, keyboards, cameras, disk drives, or other devices—incredibly easy. Simply plug in the device and it works. There’s no need to turn off your computer or reboot—USB devices are completely hot-swappable. 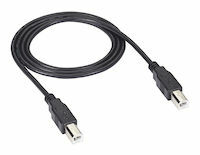 Because USB also distributes power, many USB devices don’t require a separate power supply, although a bus-powered device must be attached upstream to either a host PC or a powered hub. 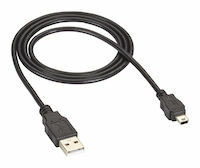 In 2002, USB 2.0, (High-Speed) was introduced. This version is backward-compatible with USB 1.1. It increases the speed of the peripheral to PC connection from 12 Mbps to 480 Mbps, or 40 times faster than USB 1.1. This increase in bandwidth enhances the use of external peripherals that require high throughput, such as printers, cameras, video equipment, and more. 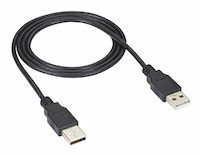 USB 2.0 supports demanding applications, such as Web publishing, in which multiple high-speed devices run simultaneously. USB 3.1 (SuperSpeed+) provides 10 Gbit/s of bandwidth, 3.4 Gbps effective throughput and 900mA of power to the downstream device. Unlike USB 2.0, 3.1 is full duplex. The USB 3.1 standard is backward compatible with USB 3.0 and USB 2.0. 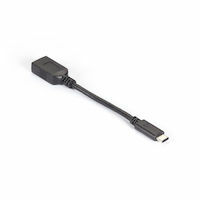 USB 2.0 Cable - Type A Male to Type B Male, Black, 15-ft.
USB 2.0 Cable - Type A Male to Type Mini-B Male, Black, 3-ft.
Connect cellphones, PDAs, digital cameras and USB On-The-Go devices. 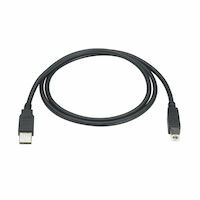 USB 2.0 Cable - Type A Male to Type Micro-B Male, Black, 10-ft. The right cable for newer smartphone and tablet connections. 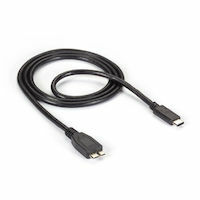 USB 2.0 Cable - Type A Male to Type Micro-B Male, Black, 15-ft.
USB 2.0 Cable - Type B Male to Type B Male, Black, 3-ft.
Hard-to-find cable with two male USB connectors. USB 2.0 Cable - Type B Male to Type B Male, Black, 6-ft.
USB 2.0 Cable - Type B Male to Type B Male, Black, 10-ft.
USB 2.0 Cable - Type B Male to Type B Male, Black, 16-ft.
USB 2.0 Cable - Type A Male to Type A Male, Black, 10-ft.
Connect devices with Type A female ports. 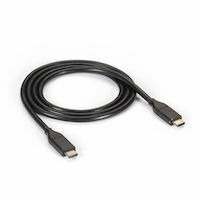 USB 3.0 Cable - Type A Male To Type B Male, Black, 6-ft.
Get ready for the future of USB. Connect, charge, and sync USB 3.1 Type C devices at 10-Gbps speeds. 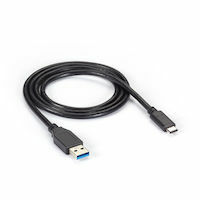 Connect existing USB 2.0/3.0 peripherals to USB 3.1 Type C enable devices. Connect, charge, and sync phones, cameras, drives, and other USB 2.0 Micro B devices.